Jaw pain and chest pressure are two of the classic signs of a heart attack, although the American Heart Association notes that jaw pain as a heart attack symptom is more likely to appear in women. Jaw pain and chest pressure can also indicate a condition called angina pectoris that results from coronary artery disease. If you think you are having a heart attack, call 911. A heart attack -- also known as a coronary attack and a myocardial infarction -- results when the flow of oxygenating blood to the heart is constricted or cut off. Coronary arteries that supply the heart with blood can become thickened and less flexible as a result of atherosclerosis, which is caused by deposits of plaque -- a collection of fat, cholesterol and other substances -- that clog the passageways. When plaque breaks off, the resultant blood clot blocks the artery and begins starving the heart of blood and oxygen, a condition called ischemia. The damage to the heart muscle due to ischemia is characterized as a heart attack. The American Heart Association reports that someone has a heart attack in the U.S. every 34 seconds. Doctors can diagnose heart attacks with a physical examination, EKG -- which makes a record of the heart's electrical activity -- and blood tests, which can detect cardiac enzymes released during a heart attack. With a heart attack, the discomfort is usually centered in the exact middle of the chest. It may last for a few minutes, go away and then return. People who have suffered heart attacks describe the feeling as an uncomfortable pressure, squeezing, fullness or pain. In addition to chest pressure and pain, you may feel pain in your jaw; other locations you may feel discomfort include the arms, back, neck and stomach. Additional symptoms include shortness of breath, nausea, lightheadedness and cold sweats. If you have these symptoms, don't delay too long wondering if you are having a heart attack. The American Heart Association lists five minutes as a good rule of thumb; if symptoms are not completely gone by then, call 911. Pressure in the chest and pain in the jaw can indicate Angina pectoris, a condition that is caused by reduced blood flow to the heart. 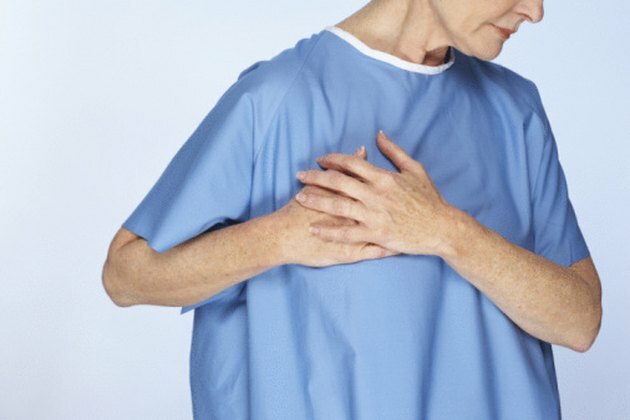 Angina pectoris, a symptom of coronary artery disease, is described as the sensation that your chest is being squeezed or is under pressure; you may feel a band of tightness, or have the sensation that something heavy is on your chest. Stable angina, the most common type, is recurring, and usually occurs with exertion; unstable angina is an uncharacteristic or new chest pain -- or a change in customary angina symptoms -- that could indicate an impending heart attack. The symptoms of angina -- chest pain, jaw pain, nausea, fatigue, dizziness and sweating -- can be similar to those of a heart attack. Risk factors for angina are smoking, diabetes, high blood pressure, high cholesterol, sedentary lifestyle, obesity and stress. It is possible that your jaw pain and chest pressure has a harmless explanation, or at least one that is not linked with coronary disease. You could have indigestion -- which can cause chest discomfort -- coupled with jaw pain from a dental problem such as TMJ, or temporomandibular joint disorder. One benign reason for chest pressure in females can be an ill-fitting brassiere that hugs the chest too tightly beneath the cups. However, if you have any reason to believe that your symptoms might be due to a coronary, you should seek emergency medical care.